» Articles » Sharp Tips » Cedar Apple Rust: Disease Disguised As "Decoration"
Cedar Apple Rust: Disease Disguised As "Decoration"
Funny how we perceive things differently while we’re still just little kids! I recall that a large cedar tree graced the fencerow on the northeastern side of my childhood home. The warm spring rains would produce brightly colored orange spherical “decorations” on this tree. The spheres were about the size of golf balls and were, I assumed, just another example of Nature’s beautiful miracles. Little did I know that, although the colorful globes were pretty to look at, they were “demons in disguise” just waiting to work their evil on nearby apple trees. 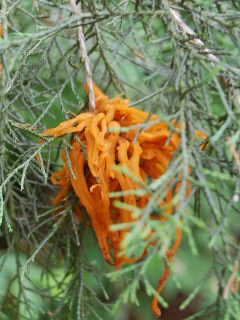 Cedar apple rust is a fungal disease, spread by spores, that requires two separate host plants (apple trees and eastern red cedar trees) in order to complete its life cyle. 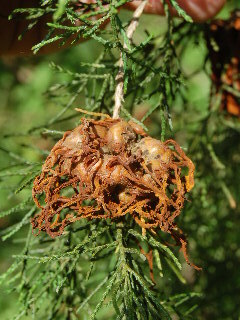 The disease overwinters on galls (gnarly knot-like growths) on the cedar trees. The warm spring rains cause the growth of orange jelly-like appendages from the galls which then release airborne spores that infect nearby apple trees. (Those once-thought-pretty “decorations” don’t sound so lovely now, huh?). Between rains, the appendages shrink and change color to resemble spindly brown strings extending from the galls. On the apple trees, the disease is manifest in the form of blisters or rot on the fruit and in the discoloration and withering of the leaves. The disease spores borne on the apple trees are then dispersed later in the summer when the air is dry and are blown onto the neighboring cedar trees where the galls are formed, thus completing and perpetuating the life cycle of the cedar apple rust. So, now that we know how to recognize this disease, how do we deal with it? Method number one. If you’re in the market for one or more young apple trees to plant at your home, be sure you purchase quality planting stock from a reliable source (Stark Brothers ® Fruit Trees are always good), and make sure the varieties you select are resistant to the cedar apple rust. Method number two. Watch for symptoms on your apple trees and use fungicides, if needed, to control and hopefully eliminate the disease. Method number three. Eliminate all the eastern red cedar trees within a radius of a couple of miles surrounding your apple orchard! Good luck on this one. This is certainly a radical method of control, but it does illustrate the fact that cedar apple rust does, indeed, need both cedar trees and apple trees in order to continue its life cycle. The other alternative, of course, is to not plant apple trees. That way, if you happen to see one of those pretty cedar “decorations”, you won’t have to worry about the harm it can cause.